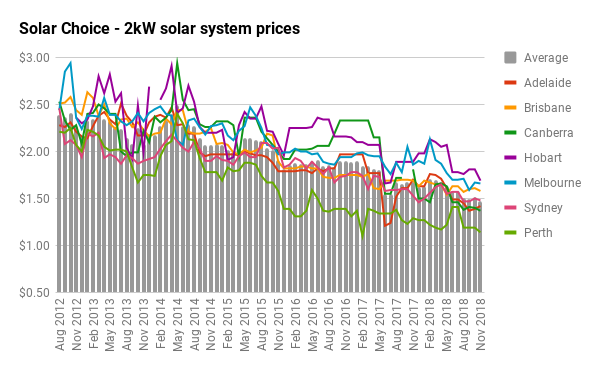 Average residential solar system prices have dipped down to $1.17 per watt ($/W) this month on the back of several factors, including changes to the composition of the Solar Choice installer network and updated pricing from installers that we work with. This is a new historic low. 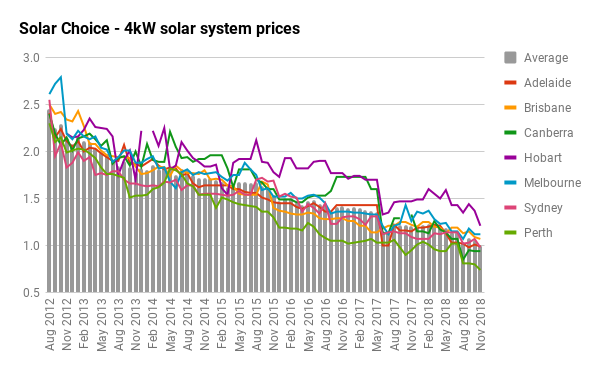 Meanwhile, average prices for popular 5kW systems have reached their lowest ever, at $0.89/W, or about $4,450 out-of-pocket. ‘Premium’ and ‘microinverter‘ options for the same size system are coming in at about $5,850 and $7,100, respectively. 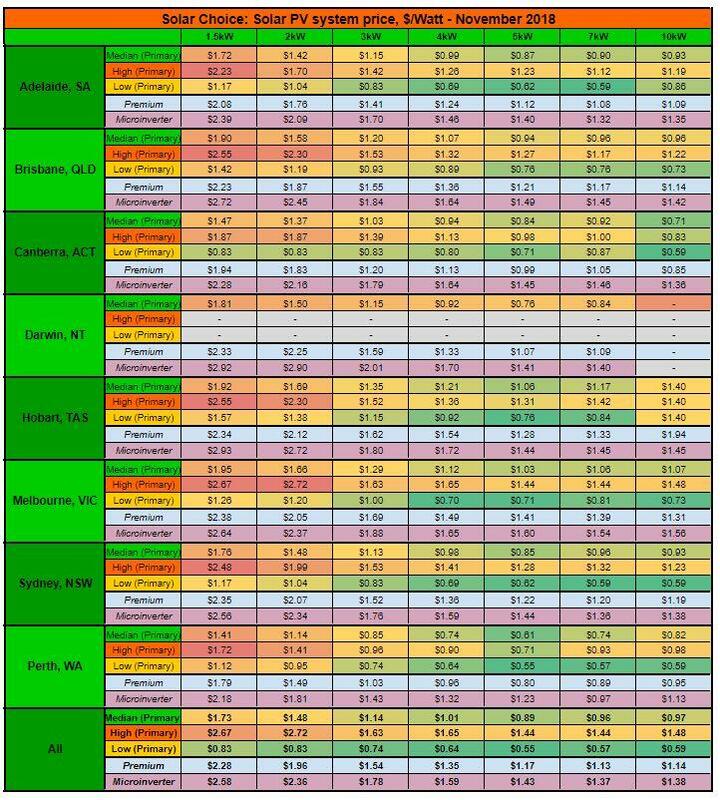 Primary offerings are the default (and most popular) type of systems that retailers and installers display on Solar Choice’s Solar Quote Comparisons (screenshot below). They are generally the lowest-price offer from a particular installer. 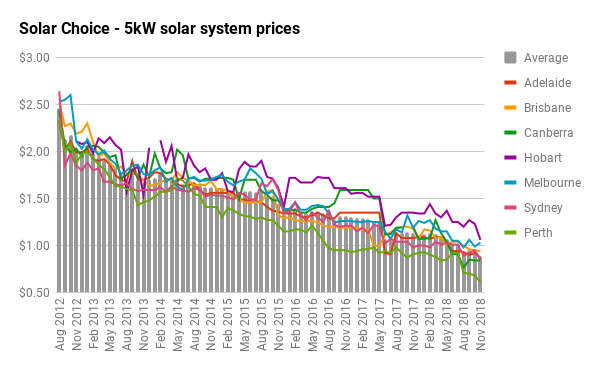 Prices in the table below include both the up-front incentive available for small-scale systems through the Renewable Energy Target (STCs) and GST – they represent the total out-of-pocket cost of the system to the customer. We’ve left fields blank where there were only a small number of price points available in our database (usually fewer than 3). Prices for each system size are colour-coded. 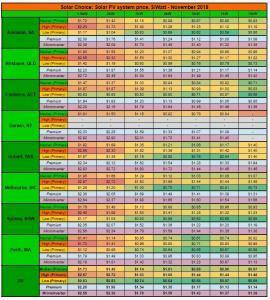 (Dark red for highest, dark green for lowest, yellow/orange for in between). Please note that the below list is in alphabetical order and does not denote panel-inverter pairings in installer offerings. Solar installers & retailers also upload pricing for ‘premium’ solar system offerings on the Solar Choice portal; these offers can then be viewed by Solar Choice customers. The definition of premium is not hard and fast, and usually comes down to the installer’s selection of components. Oftentimes, premium offers will consist of the company’s standard panel offering but a different brand of inverter – but many installers may offer a higher-end brand of panel as well. It’s important to note that the range of products used in these systems will vary greatly, and that not all premium systems are equal in their quality; in fact, one company’s premium system may be another company’s primary offering. Be sure to do your research into the brands being offered before making your decision. 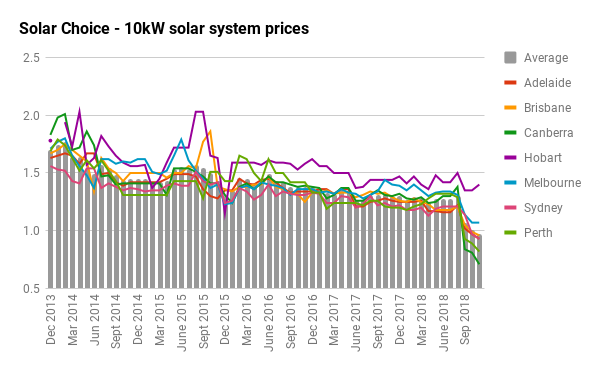 Prices in the tables below include both the up-front incentive available for small-scale systems through the Renewable Energy Target (STCs) and GST – they represent the total out-of-pocket cost of the system to the customer. We’ve left fields blank where there were only a small number of price points available in our database (usually fewer than 3). Please note that the below list is in alphabetical order and does not denote panel-inverter pairings in installer offerings. 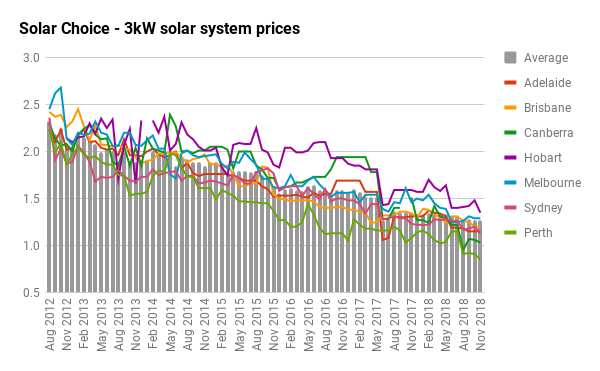 Also note that a premium offer may differ from an installer’s primary offer in a number of ways – such as the inclusion of a higher-end inverter, higher-end solar panels, or both. Microinverter systems are generally better equipped to handle shading issues and multiple roof orientations than standard, central/string inverter systems. You can read more about microinverters (and whether they’re right for your home) in this article. We also point out that microinverter systems sometimes compete with premium systems even where shading/roof orientations are not an issue, as microinverters are generally seen as high-end product. Please note that the below list is in alphabetical order and does not denote panel-inverter pairings in installer offerings. We also note that Enphase’s microinverters comprise the vast majority of microinverter offerings (roughly 90%). Also note that strictly speaking SolarEdge systems do not include microinverters, but rather power optimisers. However, they are often lumped in with microinverters because of the fact that they are similarly adept at mitigating the impact of shading and multiple roof orientations. The historic pricing in the tables below do not reflect prices for Darwin, NT. See ‘About this data’ footnote below for a more detailed description of where this data comes from and what it represents. 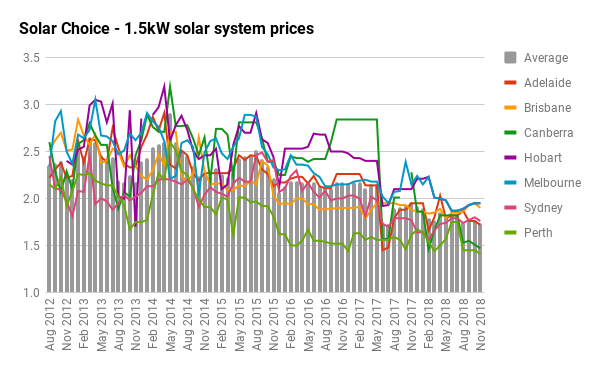 We have and will continue to included the 1.5kW solar system graph for the sake of posterity, even as we’ve removed them from the ‘All system sizes’ graph below and other tables in this article. 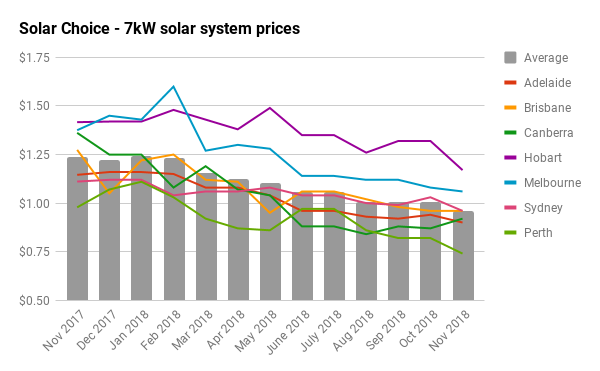 Tables and charts included in this article were compiled using data from Solar Choice’s installer network database, which contains regularly-updated pricing and product details from over 100 solar installation companies across Australia. Prices do not ordinarily incorporate meter installation fees or additional costs for difficult installations. 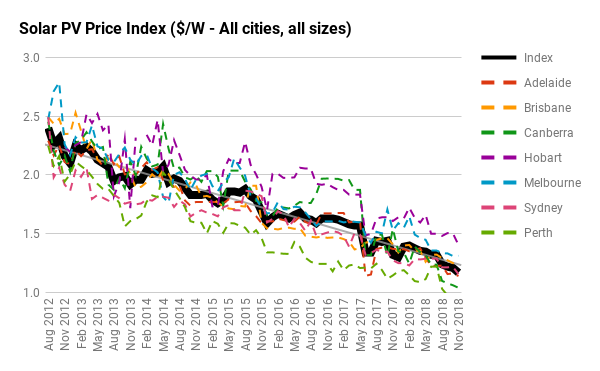 Pricing data from Darwin is not included any of the charts showing historic trends.